My goal in providing dog training is to help you develop effective and positive dog training skills so that you and your dog can have a rich and rewarding life together. Dogs A' Flying Dog Training provides pet dog and dog sport private lessons and classes no larger than 3 students. Private lessons can also be scheduled at your home. Contact Mary Hunter at 208 841-7119, or dogsaflying@gmail.com. Pet dog and puppy obedience private lessons. • 5-20-2018 - MACH2 PACH2 Flying Quick Nick du Volant RN MXS MJS MXP4 MXPB MJP4 MJPB PAX MXF T2B2 TDP SCN SIN SEC CGC competed in his first AKC scent work trial and earned his novice titles for interiors, containers, and exteriors. He did a super job. • 12-2107 - MACH2 PACH Flying Quick Nick du Volant RN MXS MJS MXP4 MXPB MJP4 MJPB PAX MXF T2B2 TDA CGC was AKC's Top Preferred Belgian Sheepdog for 2016 and was also invited to the AKC Agility Invitational as the top preferred Belgian Sheepdog during the qualifying period. I am so proud of my special agility partner. He is such a pleasure to run and to live with. • Contact Point's Jenny and Nick earned AKC Trick Dog Titles on Sept. 25, 2017. Jenny earned her Trick Dog Novice title while Nick earned his Novice, Open, and Advanced titles. • Contact Point's Jenny and MACH2 PACH Flying Quick Nick du Volant RN MXS MJS MXP3 MXPB MJP4 MJPB PAX MXF T2B2 earned their Canine Good Citizen titles from AKC on Aug 3, 2017. This is Jenny's first title. Nick has never been a socially confident dog with new people so this was a significant accomplishment. I was very proud of them and my students and their dogs who also earned their CGC's that day. You can see the Facebook post at https://www.facebook.com/mary.hunter.127​. • Contact Point's Jenny came into our life on Nov. 18, 2016. She is a darling red merle Border Collie. She will have a busy life with agility, freestyle, nose work, and more. You can follow her on my Facebook page. Look for Mary Hunter. Then I bid farewell to Belgian Tervuren, Dani, MACH2 Flashfire's Diamond Dancer. She was suffering from hemangiosarcoma. Learn more about all she did in her full life on her page. She too was an awesome agility and freestyle partner and general helper for so many years. • 5-24-2016 - Nick and I have take up herding. What a fun and interesting sport. In the meantime, I continue to increase my knowledge of canine freestyle and Rally FrEe by taking online classes thru the Fenzi Dog Sport Academy. Nick also qualified for AKC Agility Nationals but we chose not to go to Florida to compete. • 11-28-2015 - Nick and I completed the requirements for his MACH2 earning a first and second place on the runs! He is such a very good agility partner. Here's video of our final run for our MACH2 - https://www.youtube.com/watch?v=-YK29cKYBr0 . • 10-16-2015 - Nick and I are continuing our pursuit of his MACH2 title. Here's a video from the most recent trial https://www.youtube.com/watch?v=ReJ_bcOLdww . I love seeing him wag his tail on the start line. He is having a great time! • 2-15-2015 - I am revising my training to provide small classes of 3 students at a time as well as private lessons. We will train inside or outside depending on what we are working on and weather conditions. Check the class page for training opportunities. • 10-25-2014 - Nick completed his MACH (Master Agility Championship) title today with a first and second place in Ririe at the Upper Snake River Valley Dog Training Club's agility trial. Nancy Stone brought his new MACH bar into the ring while everyone applauded. Nick was so surprised about the ruckus, but then he got to run a victory lap of jumps and tunnels. He was one happy boy and ran the next day like the champion that he is. Nick has earned 9 Double Q's in his last 10 days of agility competition. On to MACH2! Here's our MACH run: https://www.youtube.com/watch?v=KT_bVDxm7Ag&list=UUXoEwctw33iE5lZaJdm7bcQ. Nick also qualified for AKC National Agility Championships to be held in Reno Nevada in March 2015. • 10-12-2014 - Nick had an awesome agility weekend at the Idaho Capital City Kennel Club and Lizard Butte Kennel Club agility trials this weekend. We competed in 10 classes and qualified on 9 earning all firsts and seconds. He earned 4 Double Q's giving us 18 of the 20 total that we need for his MACH. And he earned 119 MACH speed points putting us well over the 750 needed. Nick also earned his Rally Novice title but he found that to be extremely stressful. He sure was an awesome partner for the agility trials. Here's one of his first place runs; https://www.youtube.com/watch?v=yISMRWZIWGs&index=4&list=UUXoEwctw33iE5lZaJdm7bcQ . • 9-29-2014 - Nick and I went to the Pocatello Kennel Club agility trial last weekend, traveling with Martha McMurray and Bart. Nick was his awesome self and qualified on 7 of 8 runs earning 75 MACH points and 2 Double Q's. He now has 744 MACH points and 14 Double Q's toward his MACH. He sure is a great team mate and great guy too. • 8-4-2014 - Many thanks to Edye Conway who convinced me to enter my dogs in a NACSW Odor Recognition Test in Gresham OR last weekend. I thought my dogs could easily handle the work but I was wrong. The environment was very challenging for us but I am very pleased to report that Nick passed all 3 nose work tests for birch, anise, and clove. And Dani passed for anise and clove. I loved the challenge and now have a much better idea of what we need to do to earn our NW 1 title, with more titles to come. • 7-26-2014 - New classes starting in August and September are popping up on the classes page. You can register now. I am very excited to announce that I will be building a garage/shop that I can use for teaching. It won't be ready until November. I will be offering my standard array of classes in the meantime. designed for fun and building confidence and teamwork. • 4-16-2014 - I have updated the list of classes on the Group Classes page. Classes are listed for April, May and June. You can register now. • 3-31-2014 - Nick and I had a great time competing at the Upper Snake River Valley Dog Training Club Agility Trial in Ririe over the weekend. At first, Nick thought the different set of weave poles were problematic. But then he slept on it and qualified on all three runs per day on Sat and Sun with first or second placements. He was having a very good time indeed. He also celebrated his 3rd birthday this weekend. He is such a good guy. We need 14 more Double Q's but Nick has half of the speed points needed for his MACH. • 3-25-2014 - First of all, I have updated the list of classes on the Group Classes page. Check out what classes are coming up. Second, Nick and I competed at the Idaho Capital City Kennel Club's agility trial during on March 14-16. Nick completed his Master Standard title and his Time 2 Beat title too while earning another Double Q towards his future MACH title. He is becoming more driven all the time. He knows his job and likes it. • 3-1-2014 - First of all, I have updated the list of classes on the Group Classes page. Check out what classes are coming up. Second, Nick and I competed at the Lizard Butte Kennel Club's agility trial during Valentine's Day weekend. Thanks to physical therapy for me and Nick's growing confidence, we were a speedier team than in the past. At 26 1/2 inches tall, Nick will never be the fastest dog on the course but we had lots of fun. • 1-26-2014 - Nick and I competed in Farmington at The Great Salt Lake Dog Obedience Club's agility trial. Nick earned Double Q #3 towards his MACH but the trial was quite a growth experience for us. He hasn't competed in many venues so it was stressful for him, but he played tug with more passion than ever. Meanwhile, we are loving training at The Spoiled Dog Resort Training Annex! What a great partnership! • 1-14-2014 - I am loving helping people train their dogs at The Spoiled Dog Resort Training Annex. What a lovely facility and partnership with Melinda Carlson and her business. The second set of classes is now listed on the Group Classes page. Come see what we are up to. enjoyed the fantastic presenters and I tended to focus my learning on aggression and reactivity. But one of the most impactful presentations was on how to help your dog be less stressed at the vet's office. I plan to put this information together in a manner that I can share it with others. While I have worked with helping my dogs be more comfortable, this was a comprehensive approach that included so many other ways to help your dog, or cat. It was also a great opportunity to meet up with dog friends and meet new dog friends. • 9-29-2013 - Nick and I competed at the Pocatello Kennel Club's Agility Trial on Sept 27-29 in Pocatello ID. Nick earned his first Double Q toward his MACH title and picked up points along the way. The weather was challenging with the chilling wind. As always, they put on a great trial. such a good partner out on the course with me. • Nick, Dani, and I just had a terrific time at the BARC NADAC Games Trial on Aug 24 & 25th. Nick ran in 10 classes and earned 8 first placements and two novice titles. Dani was a dynamo and won 2 elite tunnelers classes but we bobbled on the other 4 classes. We had a great time and really enjoyed seeing my novice students getting started in competition. They did an awesome job of handling their dogs and the courses. Go to their pages to see a few runs. • Upcoming class schedules and information are available on the group classes page. If you are interested but can't commit to 6 sessions, consider paying on a drop in basis. fearful or reactive competition dogs. And I am taking an online class from Daisy Peel on Linda Mecklenberg's handling skills. These have all been a great addition to my knowledge and skills base. • 6-31-2013 - This is a late post but Nick completed his Excellent Jumpers title in Blackfoot in mid-June, and completed his Excellent Standard title on June 28 in Caldwell at the ICCKC trial. He then earned 35 MACH points. He is still building his confidence but what a guy to work thru it. He is such a good boy! • 6-5-2013 - Upcoming class schedules and information are available on the group classes page. blue ribbons. Nick finished his open standard and jumpers titles and earned 2 excellent jumpers legs and 1 excellent standard leg. We finished our Novice FAST title and earned 2 open FAST legs. And we earned 20 points and 2 T2B Q's. This is just his 4th AKC agility weekend. Thanks to Lizard Butte Kennel Club for a great trial, and great weather. Thanks to Chris Libs for a great agility partner! • 5-17, 18, 19 - 2013 - Nick and I competed in BARC's USDAA agility trial in Caldwell ID. Nick was not too confident but did bring home 5 qualifying ribbons, 4 firsts, and 1 second place. https://www.youtube.com/watch?v=Qgy_SSz0Rpw . Nick did a good job in his debut in rally obedience. He earned 2 2nd placements in rally novice. I didn't take him back in the ring for his 3rd attempt as he isn't ready to perform confidently and I want to let him grow up a bit more. He did a very nice job and tried his best. • 5-2-2013 - I competed in the BARC NADAC trial on the April 26 weekend. Dani ran great earning one Elite Chances leg and flying thru the tunnelers courses at over 6 yards per second. She hasn't slowed down at 9 years of age. Nick did an awesome job and qualified on 12 of 16 runs. He is now in Elite Regular, and Open level in many other classes. He was a great partner and only got sucked into a few extra tunnels! working with my dogs to develop our skills. • 3-17-2013 - Nick had a great time at the Idaho Capital City Kennel Club agility trial in Caldwell ID. Nick ran 11 times and finished his novice standard and jumpers titles and also earned two legs each at the open level, and earned 10 first placements. He was a great agility partner. 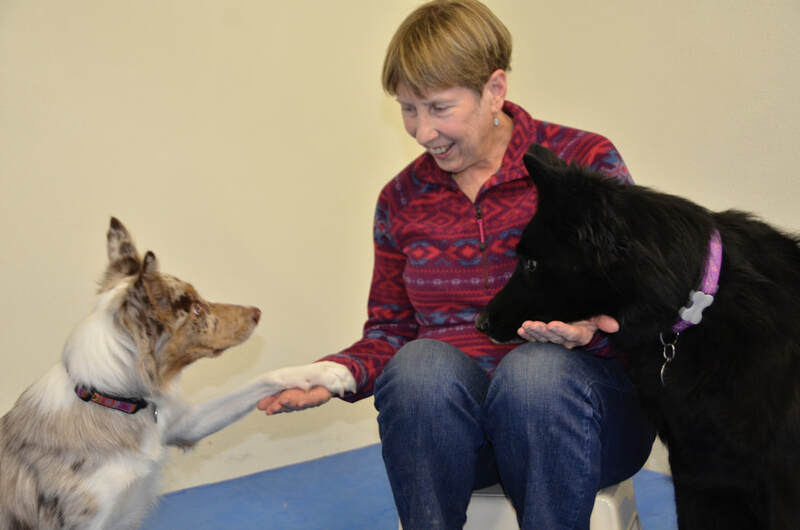 • 3-10-2013 - I participated in the Denise Fenzi Motivation Seminar sponsored by the Upper Snake River Dog Training Club in Idaho Falls. It was fantastic and I learned some great skills to improve play with our dogs. And I learned about how to help Nick be more comfortable when he is stressed. It was awesome. • 2-3-2013 - I attended the Clicker Expo in San Francisco on Jan 25-27 including an Oakland Zoo tour to watch how large animals are trained using positive reinforcement training techniques. They train the animals for the safety of the handlers, and to make it easier to move and conduct medical procedures on the animals. It was fascinating. I also learned from excellent presenters from the Karen Pryor Academy faculty. I look forward to sharing this information with students. New classes are being scheduled. Go to the Classes page. For 2012 posts, go to the Blogs page.